This is the story of David Anderson, the Resolis Registrar, who did well in life despite suffering one of the greatest and most unjust social challenges of that time – illegitimacy. 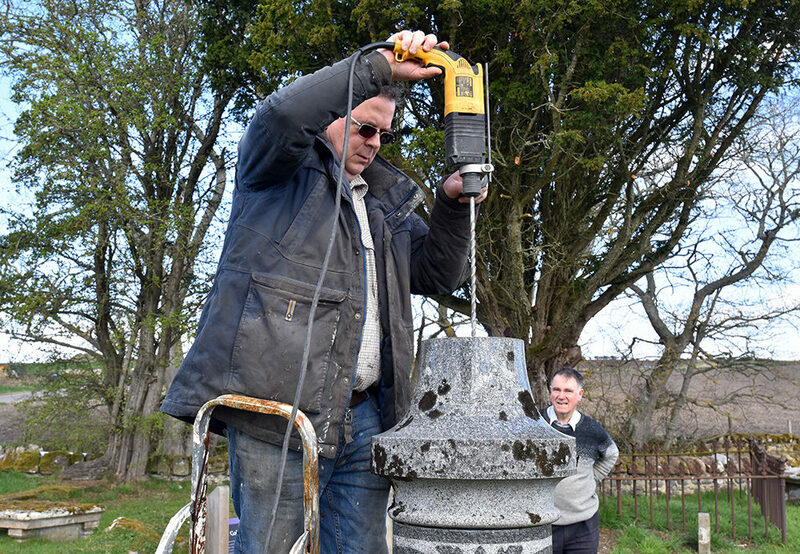 It is also the story of the restoration of David’s repeatedly-repaired memorial in Kirkmichael. 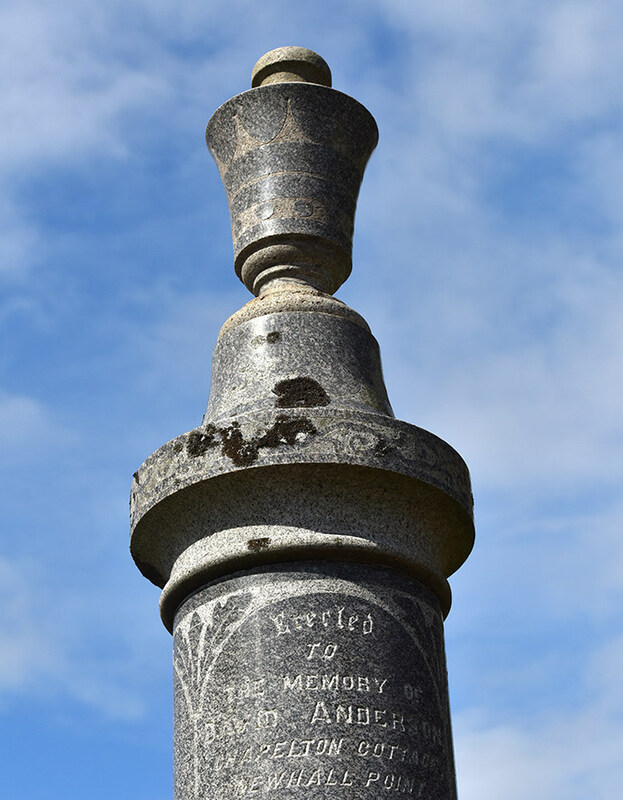 The imposing grey granite pillar commemorating David Anderson and wife Matilda Fraser was topped with a heavy urn, so fashionable in the late 1800s and early 1900s. David Anderson had left everything by his will to Donald Urquhart, Blacksmith, Newhall Bridge (and later Registrar of Resolis, and Proprietor of Chapelton Cottage) “under burden of the payment of my just debts and Funeral expenses and death bed expenses also a Head stone and Enclosure on my grave”. Urquhart followed the instructions implicitly. 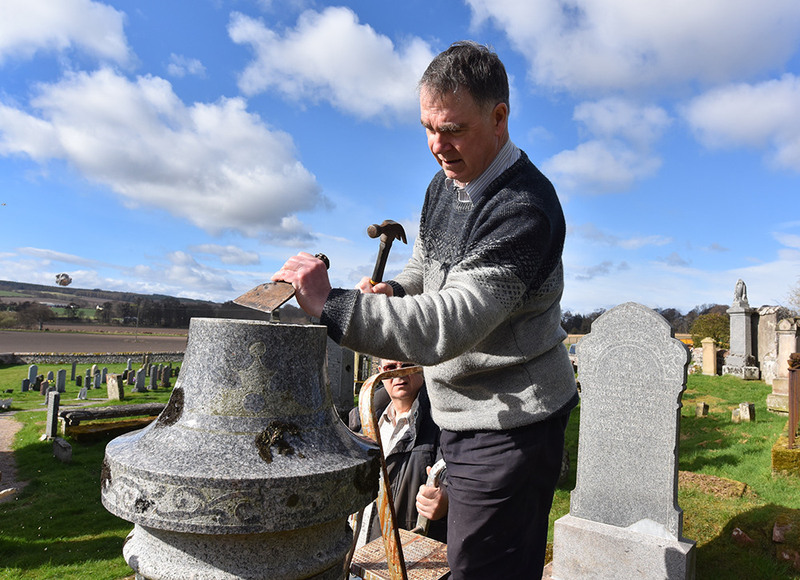 But when the restoration of the buildings at Kirkmichael was completed in 2017, and the Trust was continuing its programme of re-erecting or repairing the monuments in the kirkyard, it met a problem with the Anderson pillar. There was obviously something missing from the top of the pillar. It occupied a central location, in front of the nave, and featured in every photograph of the site. From photographs from the 1980s, there should have been a granite urn on top of the pillar but it could not be seen. 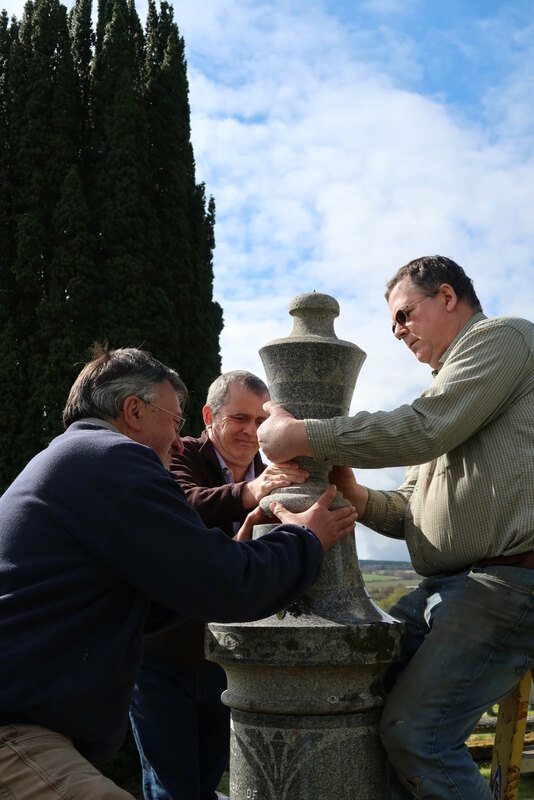 It was relatively easy locating the urn itself by groping around in the rank grass below the pillar, but it took two attempts probing the surface of the soil before the base of the urn was located. 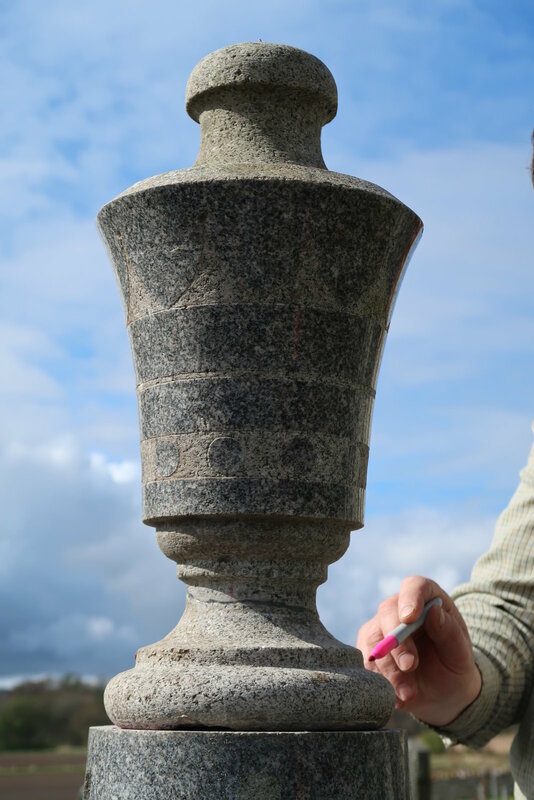 The top of the pillar and the edge of the base of the urn showed evidence of a serious impact at some time. It is not easy to understand the damage to the pillar itself. Had there been a savage attack of vandalism or had perhaps the whole pillar once toppled over? 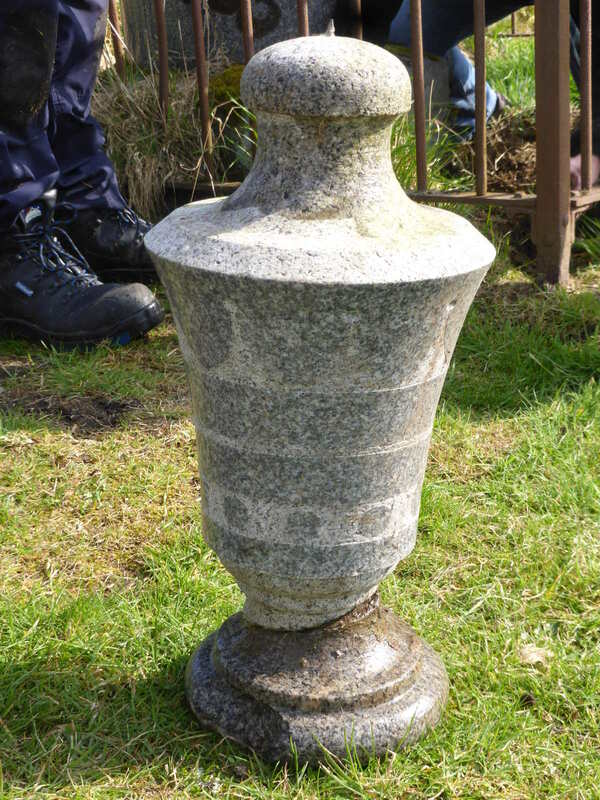 We inspected the damage and found that urn and base, originally one piece, had broken apart and had been previously joined together not once but twice! The first time was with lime plaster, but the second was with a very hard black material resembling modern resins. The problem was that neither repair had been very accurate or tidy. And neither obviously had been effective. It took a couple of hours with hammer and chisel to free the granite of the black proto-resin and lime and prepare a fresh clean surface. 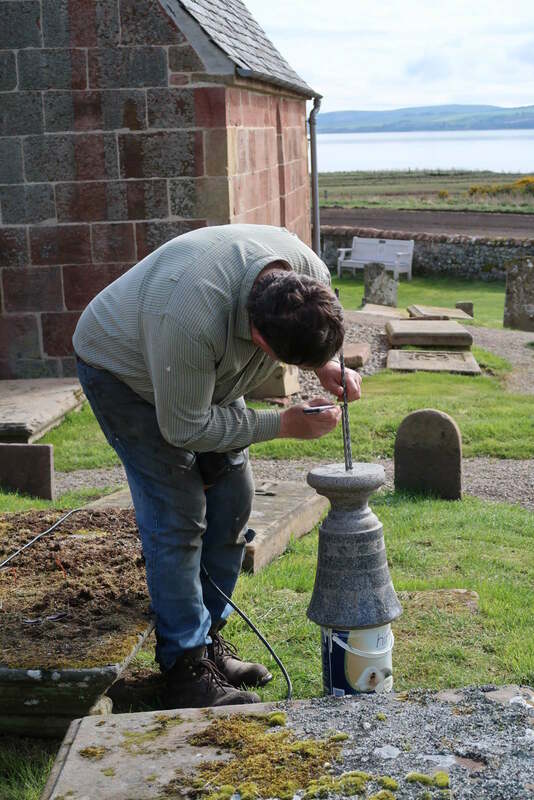 On this occasion, a hole was drilled into the urn, through the base and into the pillar, to allow a continuous stainless steel threaded rod to be imbedded with modern resin. 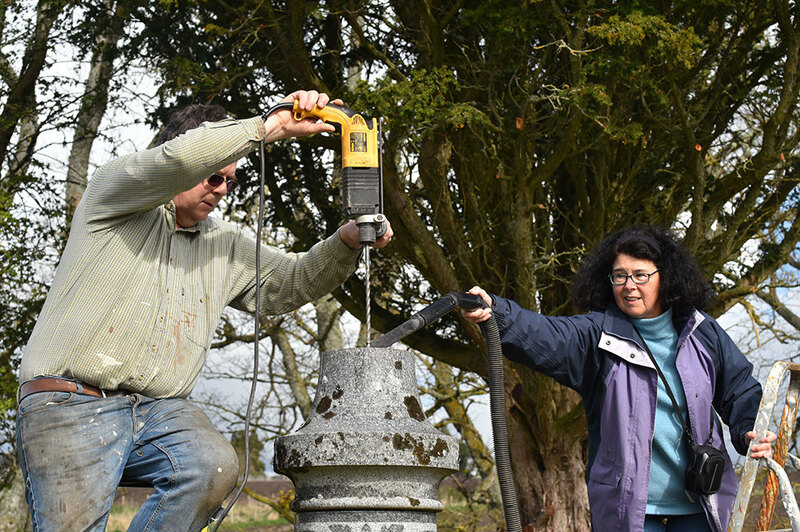 We do not often show the volunteer effort that goes into restoration, but include it on this occasion for the record (photographs Andrew Dowsett and Davine Sutherland). Time will tell if this repair proves to be third time lucky! 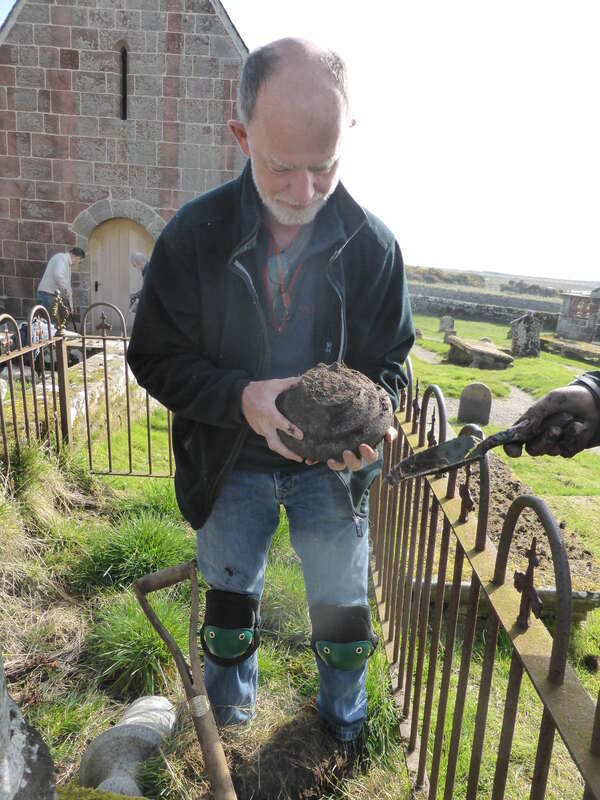 The drillhole through the urn base being used to mark centre. Chipping off plaster and making an indentation in the pillar. George now makes a pilot hole in the pillar itself. 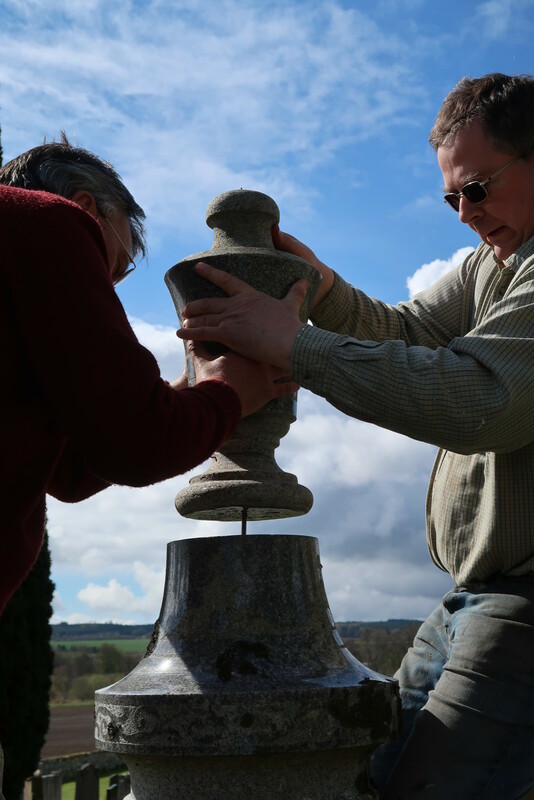 The urn in the workshop; repaired with resin and stainless steel threaded rod. The length of protruding rod being marked on the drill bit. Ready to drill the deep hole for the stainless steel rod. Health and safety observed with support for ladder. While George drills, Davine vacuums the granite dust. The last of the dust sucked out with a patent extension to the vacuum cleaner. The urn temporarily put in place to check rod fits, and perimeter of urn marked out. 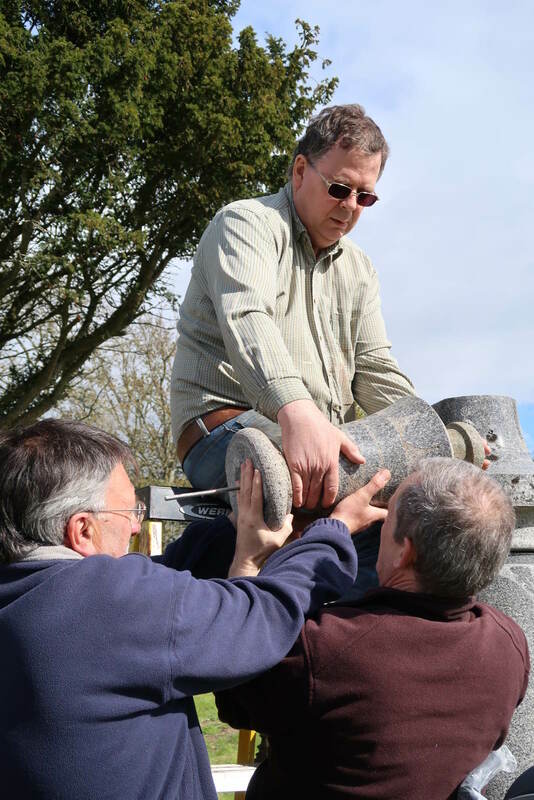 Twice as difficult to lift out, but Andrew, Andy and George succeed. 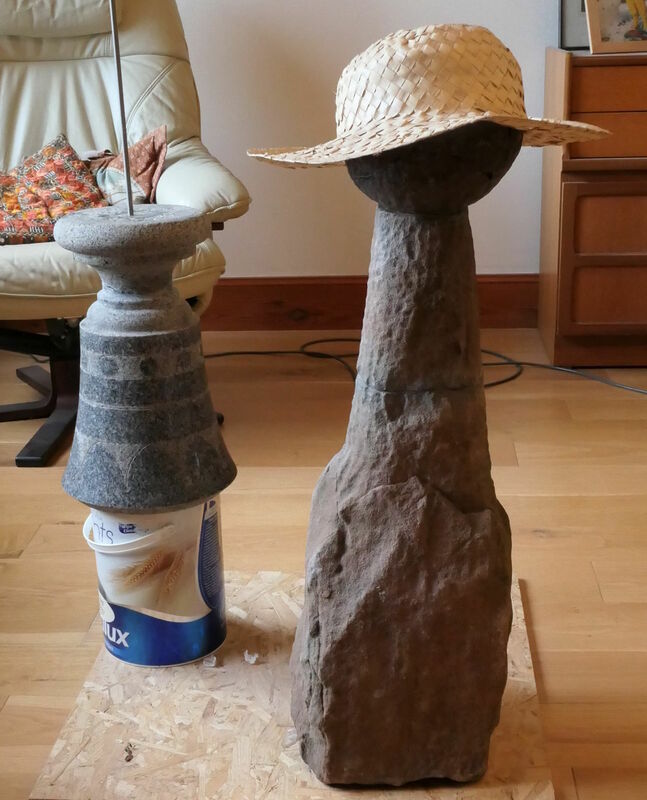 Lowered carefully to ground and resin applied to urn base. Resin poured into drill hole, cavity and marked perimeter. 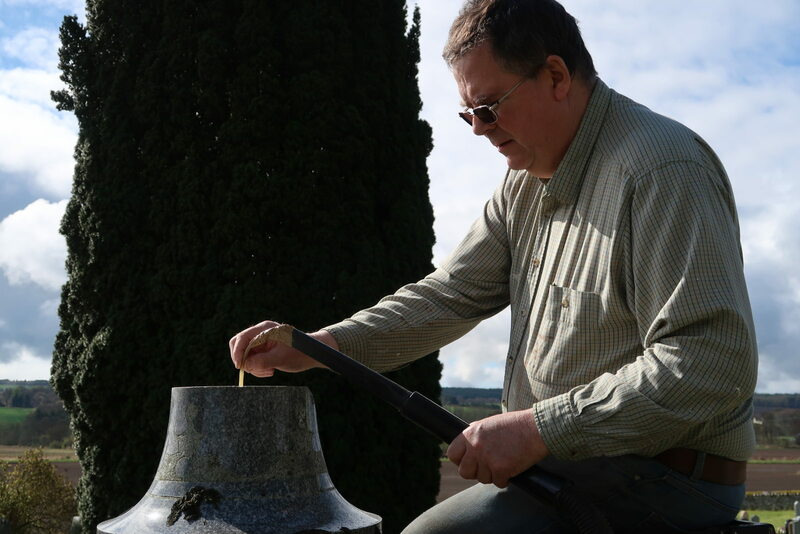 The urn is lowered into final position. 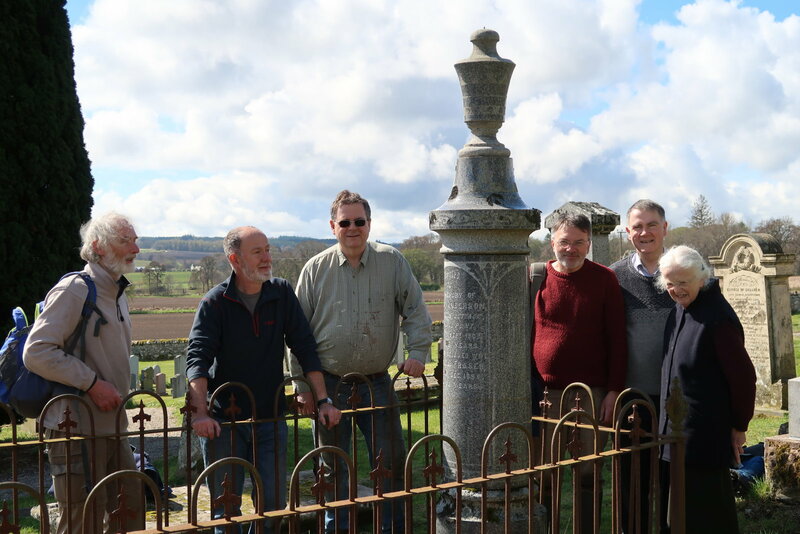 The Kirkmichael volunteers with another successful restoration. David Anderson had a successful life, despite the disadvantage of illegitimacy. It is difficult for those living in this age to appreciate the stigma endured by the woman and the child in this situation. As ever, the case came before the all-male and unsympathetic Kirk Session. At the Church of Resolis the 15 day of September 1834. 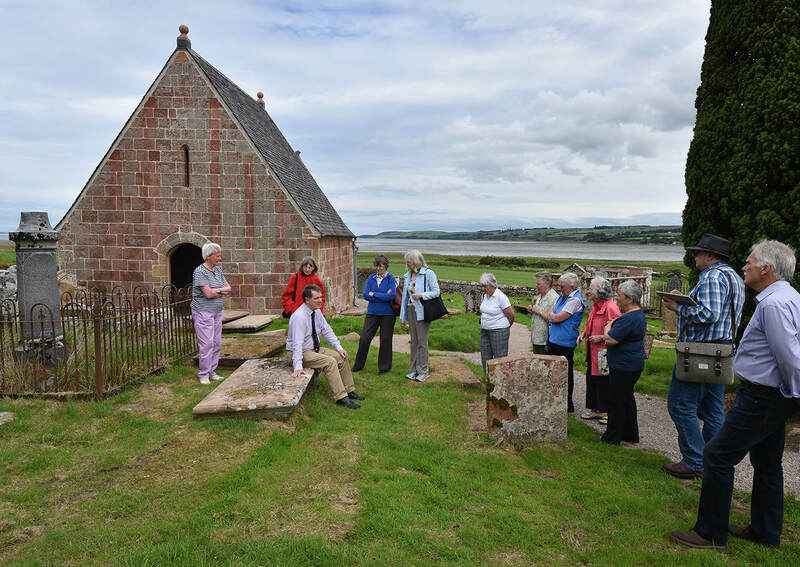 … Delation for Adultery was given in against Catherine Ferguson an unmarried woman residing at Balblair & she was duly cited to appear at this meeting. Being called she compeared & the Delation being read in her hearing she was suitably admonished to tell the truth and interrogated– Acknowledges– that she is with child in adultery– that the Father of her pregnancy is Hector Anderson a married man & Butcher in Balblair– that they were guilty with each other only once and at her mothers house in Balblair. / The Session having duly considered the above confession of said Catherine Ferguson resolve to cite the said Hector Anderson to compear at the next meeting of Session to hold here a fortnight hence & to the same meeting they also cite the said Catherine Ferguson apud acta. At the Church of Resolis the 29th day of September 1834. …The Session took up the case of Catherine Ferguson and Hector Anderson for Adultery & two of the members reported that Hector Anderson had absconded & as was also reported had left the country on the day after he had received the citation to attend at this meeting. The Session resolved to sist proceedings in this case untill the said Hector Anderson should return. There is no record of Hector ever returning, but seven years later Catherine had her child baptised, and she had no hesitation in giving Hector’s name as the father. David took his absent father’s surname throughout his life. The first date is of his baptism, the second of his birth. It can be unhelpful when a Census enumerator, instead of giving a Christian name, simply describes a lady as “Widow”, particularly in this case when there is doubt as to whether she was Mary or Margaret. From Catherine’s death certificate her mother was Margaret Ferguson, ms Fraser. I think her husband, a boat-builder and carpenter in Balblair called Donald Ferguson, had died much earlier, as you’ll see reference to “mother’s house” in the 1834 Kirk Session case. He clearly helped with the ferry as well, as I see reference in 1838 (when Newhall was taking legal action against tenants who were in arrears) again to “Margaret Fraser or Ferguson – Widow of the late Donald Ferguson Ferryman at Balblair”. Anyway, despite being £4.19.6 sterling in arrears, she was still there at Balblair in 1841. But when you look at Catherine’s birth, the picture is different. Catherine herself had been baptised, and presumably born, in 1796 as on 15 December of that year the baptism register has “Donald Ferguson Carpenter at Balblair & Mary Fraser his Spouse had a Daughter baptized named Cathrine.” It was Mary again on the baptism in 1794 of her brother George, the only sibling recorded. So which was it? Mary or Margaret? Let’s stick to “Widow Ferguson”! I can’t pick up David’s mother Catherine definitively in 1851, but she had rejoined her son by 1861. 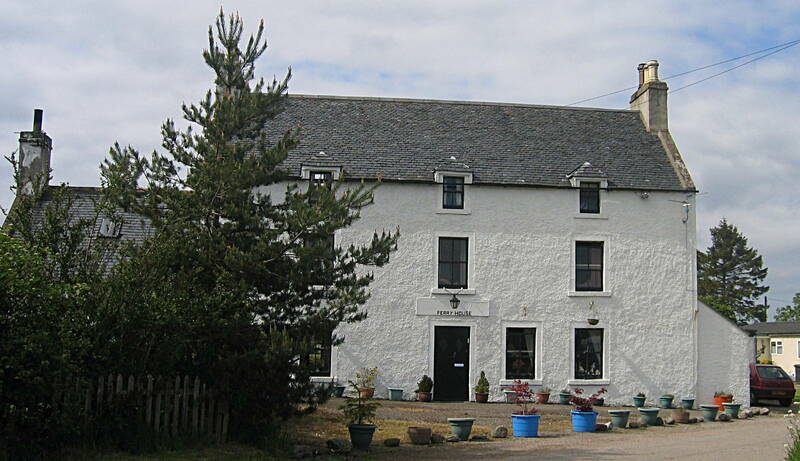 David had now established himself as a tailor in his own right, in a three-windowed house in the Craggan area. His former master, Ebenezer Urquhart, was no longer in Resolis. In 1866 David married Matilda Fraser, a relative of Cullicudden photographer Donald Fraser, whose life and photography are addressed in the separate Story behind the Stone Donald Fraser Photographer. It was in this period that David’s career and location changed dramatically, because surprisingly he moved from being a tailor to ground officer for the Newhall Estate. That is how he was recorded in the 1881 Census, and as we know that the previous ground officer, Alexander Ferguson, died in 1875 it was probably not long after that when David took over. I note that in that very census he acted as enumerator for one of the Resolis districts. How does a man go from being a tailor to the management post of ground officer for an Estate? There is a story in there yet to be explored! The ground officer was the laird’s man on the ground, sorting disagreements among tenants, advising on replacement of tenants, ensuring the tenants were carrying out maintenance duties like draining and fencing. 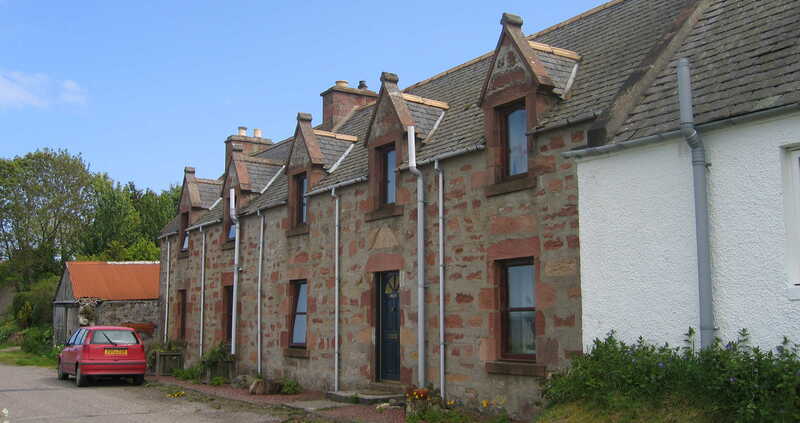 Importantly, Anderson had the Gaelic, absolutely essential when negotiating with the tenants. David Anderson clearly was competent in his job as he was still in Burnside as ground officer for the Newhall Estate in 1891, with Matilda and a female servant. Yet another career swerve was on the cards as, on 31st May 1893, David Anderson became the Resolis Registrar. His neat signature thereafter adorns every birth, marriage and death registration until his own death. 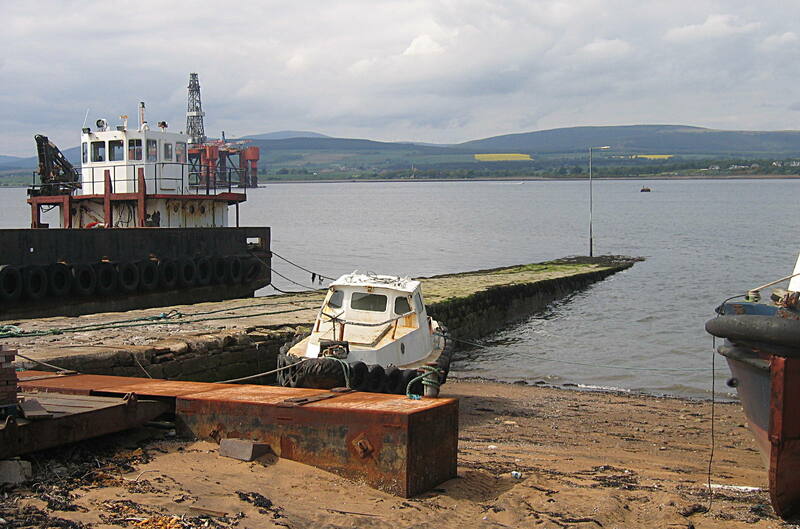 On Tuesday evening an indignation meeting to protest against, and take some action regarding the present management of the Invergordon ferry, was held in Balblair Inn. Rev. Mr Macdougall, Resolis, presided, and spoke of the unsatisfactory manner in which the ferry was conducted, and said he was sure they would all agree with him in stating that they were labouring under a great disadvantage by the rules and regulations not being adhered to by the lessee. He had suffered great inconvenience himself, and he thought it would be well that the matter should be properly discussed. 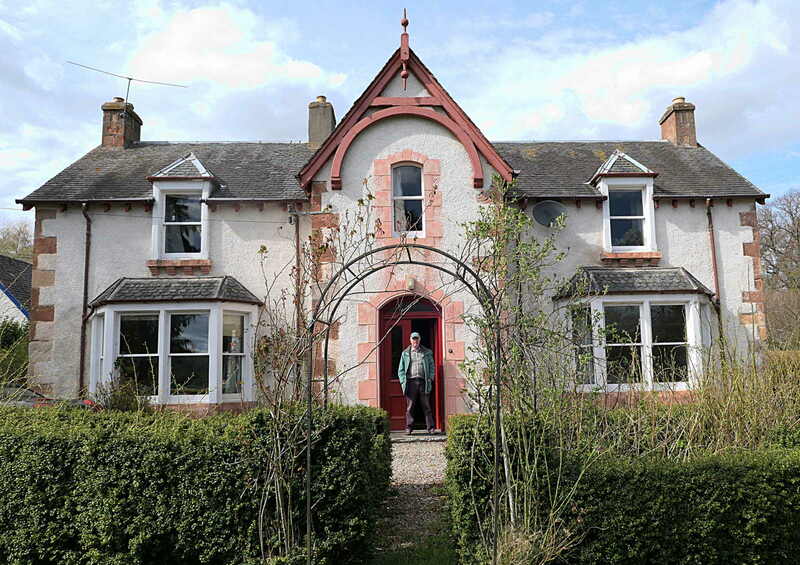 Mr Craigen, Kirkton, referred to the present arrangement as a rotten concern from top to bottom. When they went into the present ferry boat they did not know whether they would get landed or not. The piers were also in a remarkably bad state. He thought there should be two ferry boats on the ferry. Mr Brown, veterinary surgeon, Invergordon, also spoke strongly against the present system, and urged immediate reform. Mr Holm thought the ferry would not be right until the County Council took it over. Mr Urquhart, merchant, Balblair, and others, expressed themselves freely as to the inconvenience caused by the way the ferry was presently worked. Mr Anderson, Chapelton Cottage, moved, and Mr Craigen seconded, the following resolution:– That the meeting express its deep dissatisfaction with the manner in which the ferry has been worked for some time back, the regulations of the Justices being systematically laid aside. A couple of years later, David had the difficult task of registering the death of his own wife Matilda, who, five years older than he, passed away in 1895. As an aside, this sad entry does suggest that Anderson, despite being the parish Registrar, had not given up his ground officer post. Two of his boarders sallied forth from their lodgings in a salmon poaching case reported in the Ross-shire Journal of 5th April that year. A group of nine Cromarty fishermen, not for the first time, were illegally fishing for salmon up the firth. They were spied on by Nesbit, the inspector of the Conon District Fishery. The fishermen came down the firth, with the inspector following on his bike from Conon, to Balconie, to Evanton where he wired James Chisholm at Balblair. James Chisholm, water bailiff of the Conon District, residing at Balblair, deponed that on the day in question he received a telegram from Nesbit from Novar– “Two boats Balconie Seize Fish.” Accompanied by Donald Ross, John Johnstone, and Angus Chisholm, all water bailiffs, he crossed the ferry, and on the other side met Alexander Finlayson also a water bailiff. When crossing the ferry he saw two boats coming down opposite Alness. 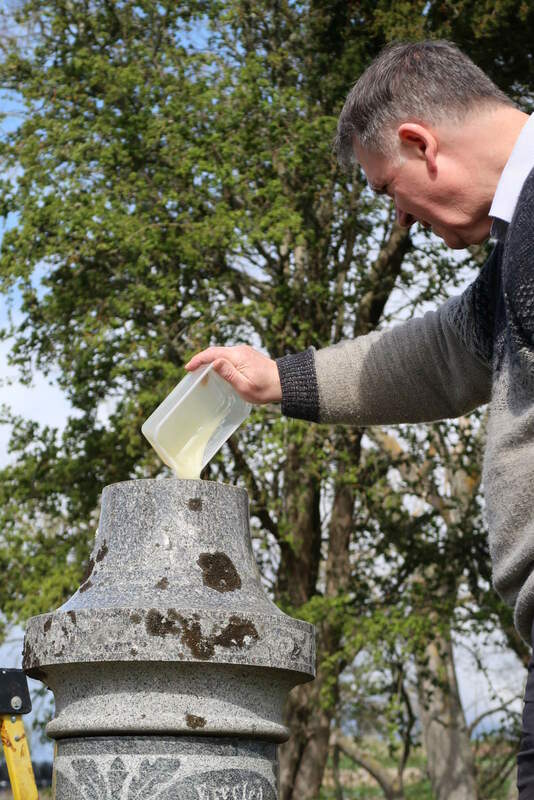 There seems to have been a very strong water bailiff contingent in the Balblair area, including the two residing within David Anderson’s house! Suffice to say that the Cromarty poachers were fined, but undoubtedly were undiscouraged. Died, on the 11th instant, at Newhall Point, very suddenly, David Anderson, Registrar of Births, &c., for the Parish of Resolis. 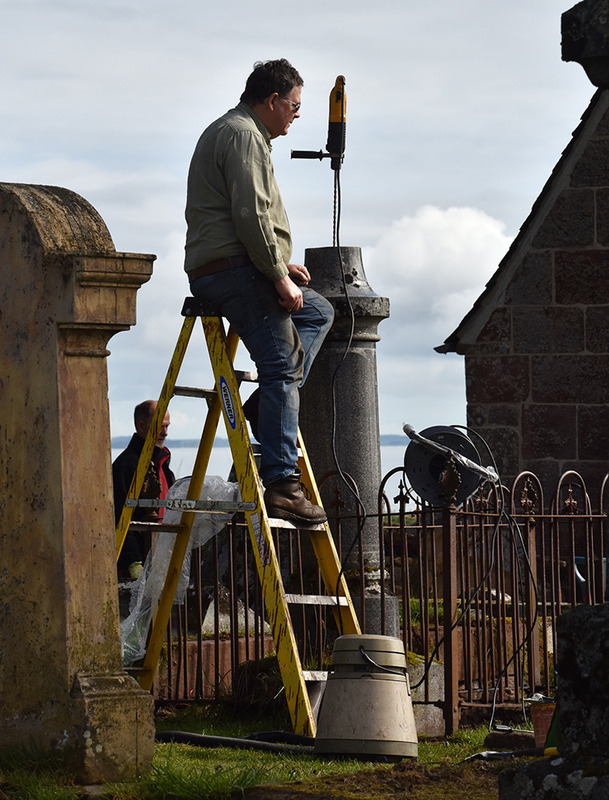 Funeral to Kirkmichael Churchyard To-morrow (Saturday, 14th instant) at 1.30. Friends will please accept this intimation. David had, a year earlier, made a will leaving everything to Donald Urquhart, the Blacksmith at Newhall Bridge and future Registrar. There must be a story behind this. The value of personal and moveable effects amounted to £300.8.3, a substantial figure. 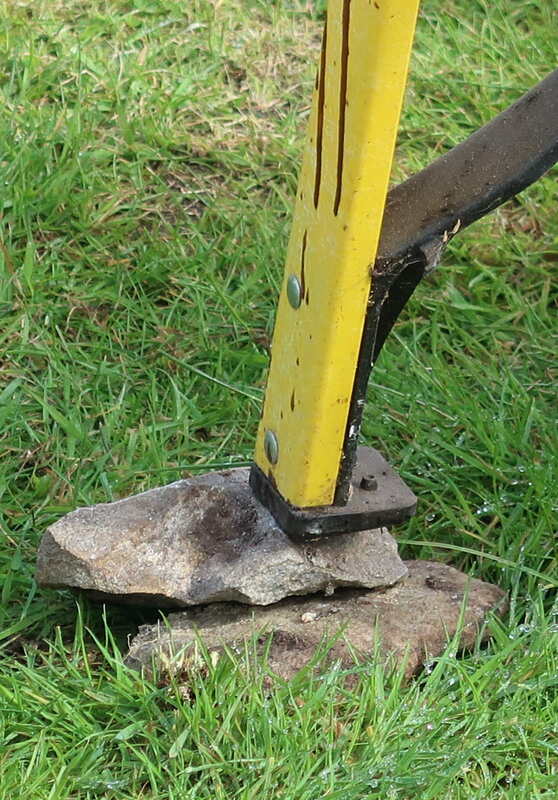 One requirement on Donald Urquhart was to erect a headstone and enclosure on David’s grave. The iron railing of the enclosure, one of very few remaining at Kirkmichael, has no gate, so modern grasscutters have let the vegetation become rank and overgrown. 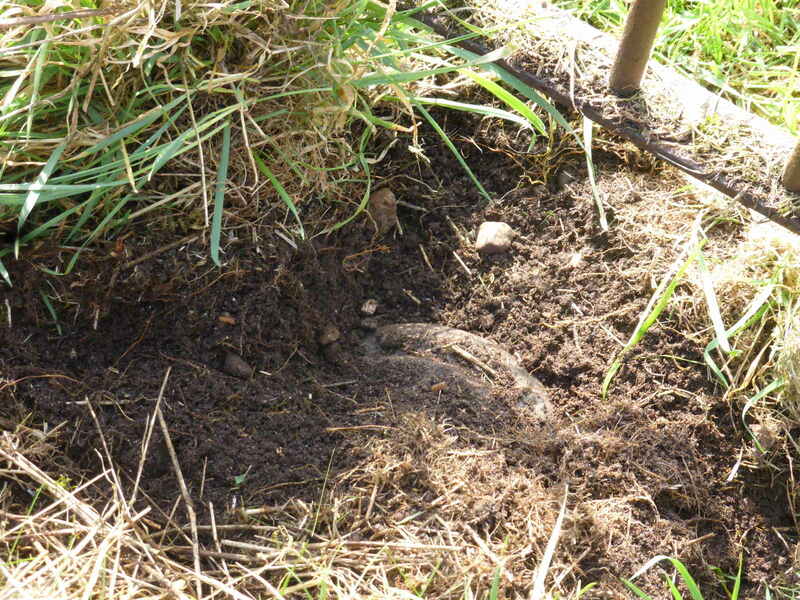 Whilst we were repairing the pillar we levelled and resowed the plot, although it is likely to become overgrown again. 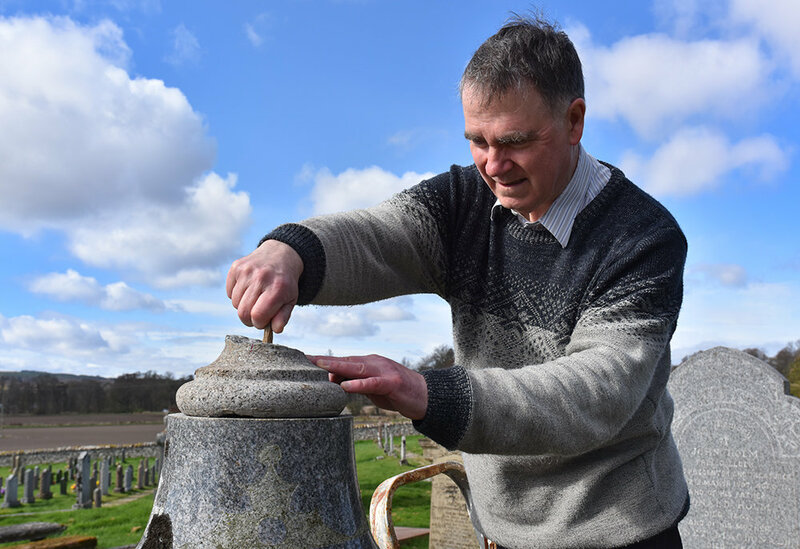 But at least the urn has been restored to make the memorial to David Anderson and Matilda Fraser complete once more.